Ukrainian ballots have blood on them. 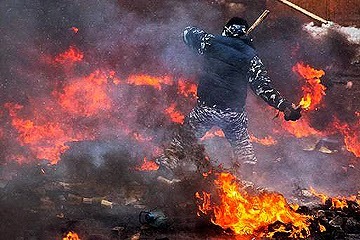 Three months of deadly protests and pitched battles have wounded and killed hundreds of citizens. Meanwhile, Ukraine's parliament voted to remove President Viktor Yanukovich. 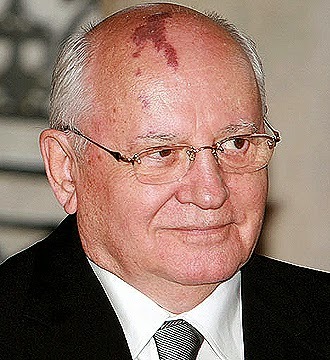 Mikhail Gorbachev, another former leader of a different country and time, recognized this Red Revolution noting that the political crisis in Ukraine stemmed from its government's failure to act democratically. In a muddled world of fiery breathing dragons, even coups can appear democratic. But representative governments have a way of sometimes behaving badly. Gorbachev was also ousted and arrested after establishing long awaited political and economic reforms in the former Soviet Union. His crime was being a moral reformer, in the sense that, he set out to restructure the Communist Party instead of destroying it. Because of this, members of the State Emergency Committee placed Gorbachev under house arrest in 1991, preventing him from signing a treaty that provided autonomy to the Soviet republics. Yulia Tymoshenko, Yanukovich's rival, hailed the coup, calling armed protesters "heroes." Her release marks another radical transformation in Ukrainian history, one that will move it closer to Europe. It will also quicken privatization and increase inequality, something that globalization and Tymoshenko's prior reforms have already done. Ukrainians have mixed emotions. Don't be surprised if this new change drives a deeper wedge between eastern and western Ukraine, someday creating two countries. But just how treasonous and criminal was Yanukovich's behavior? Was it his lifestyle, or merely wanting to remain pro Moscow? Tymoshenko announced assurances that the Ukraine will join the European Union and move closer to the U.S.. However, seldom do fiery speeches slay disillusionment. Neither do they eliminate high unemployment and health problems, neo-Nazism and pro-Stalinism, political and economic corruption, nor ethnic and religious differences. 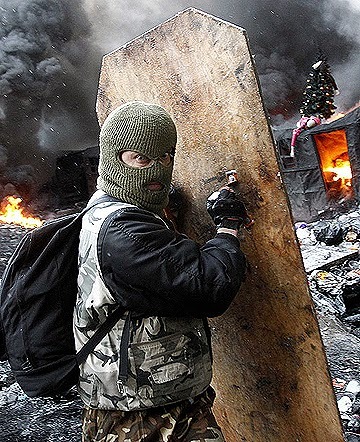 Armed extremists are still roaming the streets of Kiev. Gorbachev and Yanukovich were unable to slay all of the dragons that haunted them and their respective nations, especially the dragons that remained entrenched in state, military, and corporate institutions. They could not change the views of some political opponents who remained in power, whom then interpreted and used the same representative laws and constitution against them. Gorbachev was arrested. As for Yanukovich, some are wanting to try him for "mass murder of peaceful citizens." Deeply embedded in Ukrainian mythology is the dragon slayer Kyrylo Kozhumiaka. He was endowed with tremendous strength and ultimately freed the people of Kiev from the vicious reign of a dragon. (1) In this seemingly modern world, there are still dragons but with differing forms. Along with disillusionment and poverty, illegitimacy and mistrust, armed violence and secession, and national debt and the push and pull factors of international forces, there are the dragons of representative politics and of choice. Ironically, it was Gorbachev's policies of perestroika and glasnost that helped people in the Ukraine demand more freedoms and ultimate independence. But economic reforms and openness, restructuring and transparency, even a representative democracy that turns misrepresentative, can become dangerous. Like dragons, they seek to devour whoever and whenever. Dallas Darling is the author of Politics 501: An A-Z Reading on Conscientious Political Thought and Action, Some Nations Above God: 52 Weekly Reflections On Modern-Day Imperialism, Militarism, And Consumerism in the Context of John's Apocalyptic Vision, and The Other Side Of Christianity: Reflections on Faith, Politics, Spirituality, History, and Peace. He is a correspondent for www.worldnews.com. You can read more of Dallas' writings at www.beverlydarling.com and wn.com//dallasdarling. (1) Gall, Timothy L. Worldmark Encyclopedia of Cultures and Daily Life. New York, New York: Gale Publishers, 1998., p. 394. (2) Maddex, Robert L. Constitutions of the World. Washington, DC: Congressional Quarterly Inc., 2001., p. 366. Ralph Nader : Obama The "Executioner"